There are, of course, various ways to cook fish on the barbie, but one of our favorite, and certainly one of the most interesting and elegant, is cedar-planking. It’s one of those funny places where the whole turns out to be something greater than the mere sum of the parts. 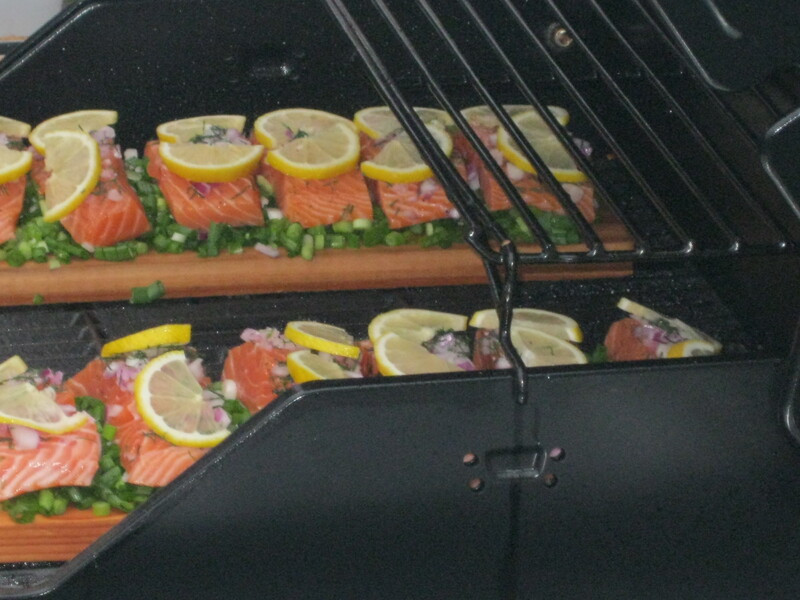 The salmon picks up a very delicate smoky/woodsy taste that is quite unexpected. Close your eyes for a minute to savor the flavors, and your imagination will conjure up images of the rain forest with the ocean surf lapping on the nearby shore….magical! So here’s what to do: get an untreated piece of cedar (usually the meat/fish department in the grocery store will have them), soak the board in water overnight, keeping it submerged until you’re ready to BBQ. Preheat the BBQ, one side on high, the other side on medium. 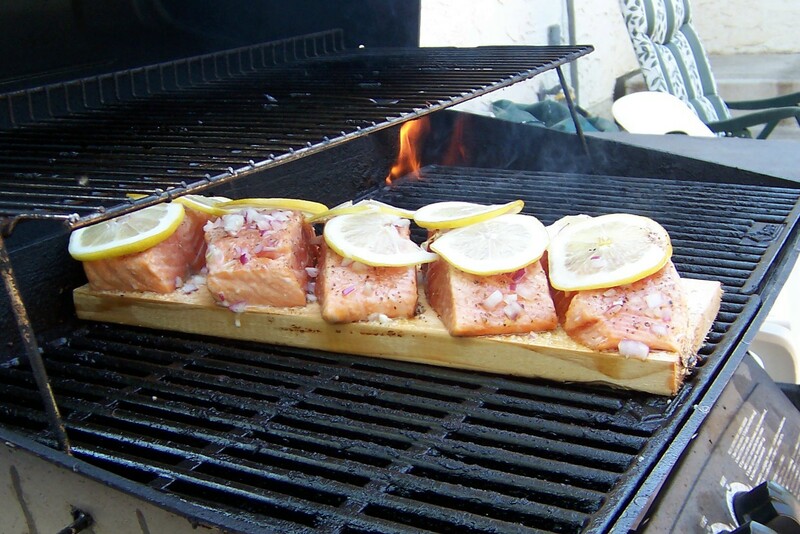 Drizzle both sides of the pieces of salmon with olive oil and arrange on the cedar plank. Sprinkle the fish with a little bit of salt and pepper, some finely chopped red onion and layer on a couple of thin slices of lemon. Now put the whole thing on the cooler side of the grill and close the lid. Keep a squirt bottle of water handy in case of flare-ups. You want the cedar to gently smoke, but not to burn too fervently. Depending on the thickness of the fish, it should take between 15 minutes to a half-hour to cook.